I got this from my brother-in-law, Eric, the other day who works for Kindred Spirit Catering. My sister raved about it so, naturally, I asked for the recipe so I could try it out and bring it to you, my trusty readers. Eric is a total natural with food and makes some mean, unpretentious fare. I’ve written about him before as he’s the creator behind the Parsnip and Celery Root Puree (with cardamom and vanilla I might add! ), and the one who roasted the unbelievable lamb last Christmas. I tried this one last night and it’s a keeper for sure. 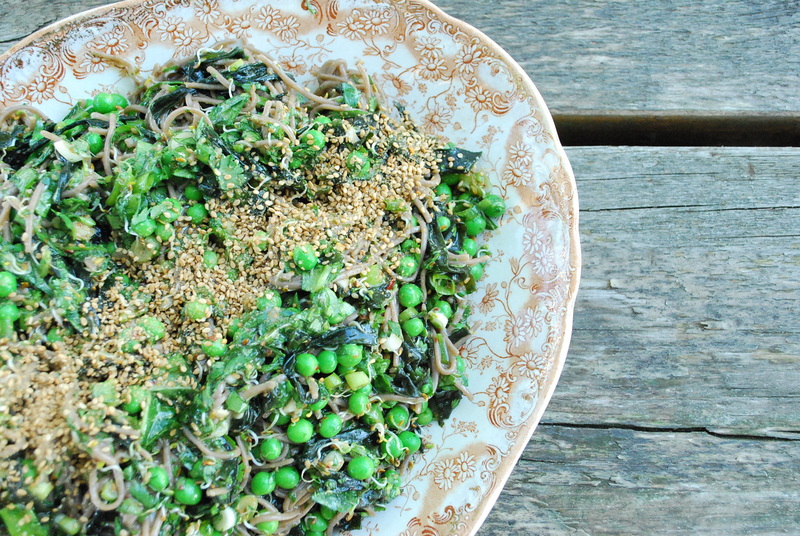 It’s healthy, it tastes good, it keeps well, it’s got a nice balance of sweet and spicy, and it lends itself well to substitutions (for example I used fresh shelling peas from Prince Edward County instead of edamame; fresh arugula instead of spinach). Cook this, enjoy, and feel like a million bucks. Thanks Eric! Cook soba noodles according to the instructions on the package. Refresh under cold water. Steam edamame beans in boiling water for 1 minute. Refresh under cold water. Soak wakame seaweed in cold water for 5 minutes until it expands and becomes soft. Drain thoroughly and squeeze out excess water. Combine with other salad ingredients in a bowl and toss lightly to mix evenly. For the vinaigrette, place all ingredients other than the olive oil in a food processor. Turn machine on and slowly drizzle in the olive oil to emulsify the mixture. Drizzle salad with the vinaigrette and toss gently. Top with cilantro or parsley and serve.